For preparing your child for a successful camp experience. In just a few weeks, your child will be going to day or overnight camp for the first time. Camp is an exciting, new experience for your child but as the first day approaches, it is common for some children to feel some uneasiness. As with any new situation, it is always good to prepare your child as best as you can. Here are just a few tips of things you can do to prepare your child for a successful summer camp experience. One of the most important things you can do for your child is to share positive messages about camp. Talk about all the wonderful activities the camp offers, all the friends your child will make and remind your child about the things he or she was excited about when you first made the camp decision. Even if you are feeling a bit of apprehension about your child going to camp, you should do your best to not share these thoughts with your child. Share positive messages about camp and let your child know that you are confident that he or she is going to have a great time at camp. 2. Meet other first-time campers. Sometimes children worry about not knowing anyone at camp before they get there. Camp is an environment where friendships are fostered and your child will meet friends on the very first day of camp! But some children feel more comfortable having a familiar face on that first day. Many camps host a pre-camp event for first time campers. This is a good way for children to meet other children going to the camp for the first time. It also gives campers a chance to get to know the camp director and for the director to get to know you and your child. If your camp doesn't host these get-togethers, ask if there is a family who lives close by to you that you can call and set up a playdate with. 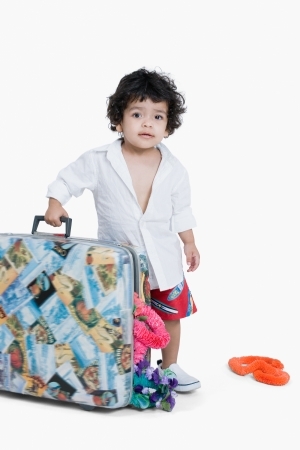 If your child is going to overnight camp, it's a good idea to pack together. Knowing what your child is bringing will help your camper feel more comfortable. Packing together also gives you a chance to talk about camp. Each camp has its own policy on what can and can't be brought to camp so be sure to look at the packing list and to respect items that the camp asks you to leave at home. 4. Talk about the bus ride. Whether your child is going to day or overnight camp, sometimes children get nervous about the bus ride to camp. For many children going to day camp, this is the first time they take a bus. Talk about what the bus ride will be like and what your child can expect. Some day camps set up a time prior to the first day of camp for campers to meet the bus counselor, which can help a child feel more comfortable. 5. Questions: Encourage your child to ask questions about camp. Your child will feel more comfortable going to camp if his or her questions are being answered. If you don't know the answer, check out the website or call the camp director. The camp director is happy to answer any questions you or your child may have about camp. Now that the first day of camp is almost here, it's a good time to revisit the camp website with your child. Check out the daily schedule, the virtual tour, the list of activities, any online videos and the picture slideshow. Looking at the website together reminds your child of all he or she is excited about and also gives your child a chance to ask any questions about camp that he or she may not have thought of. 7. Watch the camp video. Remember the camp video you watched when you first decided on camp? Watch it again! Seeing a video of camp and all the fun the campers are having reminds your child of the camp tour you took the year before and will show camp in action which will only get your child more excited for the first day of camp. 8. Call the camp director. If your child is getting nervous about the first day of camp, you can always contact the camp director for advice. Camp directors want your child to have a great summer at camp and have a lot of experience helping children transition to camp. The director can offer you some tips to help your child overcome any worries and get them even more excited for the first day of camp to arrive.